Many nonhuman animals (animals) show abnormal behavior when reared in captivity absent contact with other members of their species. Now, we have more details about the effects of captive rearing on chimpanzees. 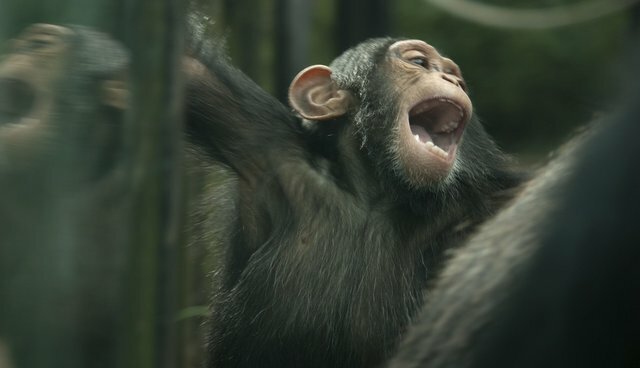 In a study published in the journal PeerJ by Hani D. Freeman and Stephen R. Ross called "The impact of atypical early histories on pet or performer chimpanzees," we learn that "chimpanzees who experienced less exposure to other chimpanzees as infants showed a lower frequency of grooming and sexual behaviors later in life which can influence social dynamics within groups." Researchers Freeman and Ross studied 60 chimpanzees (25 males and 35 females whose mean age was 21 years with a range of six to 54 years) and analyzed data for 1,385 hours of observation. 36 of the chimpanzees had been former pets or performers. The chimpanzees are currently housed at accredited zoos or sanctuaries. Freeman and Ross also developed "a unique metric, the Chimpanzee-Human Interaction (CHI) Index that represented a continuous measure of the proportion of human and chimpanzee exposure subjects experienced and here focused on their exposure during the first four years of life." This is a useful index that can readily be applied to other studies and will make for more reliable comparisons among them. Good summaries of this study can be read in a report by Catherine Griffin called "Pet Chimpanzees Suffer Behavioral Problems for Years After Human Contact" in which Dr. Ross notes, "One of the startling aspects of these findings is that these behavioral effects are so long-lasting," and in a news release titled "Chimpanzees raised as pets or performers suffer long-term effects on their behavior" in which he states, "Denying them [chimpanzees] access to members of their own species, during the critical infanthood period, results in behavioral outcomes that last a lifetime. Even with the best possible care as adults, they often can't fit in with the other chimpanzees." There are a number of important aspects of this study. First, it is clear that early experience significantly influences later behavior and individuals reared in captivity will need a good deal of special attention in attempts to override the consequences of abnormal rearing and the behavioral deficits from which they suffer. Second, there is significant individual variation in responses to captive rearing in terms of social and sexual behavior, and the authors correctly stress that "Future studies should help identify what variables lead to better social resilience in order to aid chimpanzees who struggle more with social integration." In addition, because it is virtually impossible to place these individuals back in the wild, they will have to live their lives out in a variety of captive conditions and knowing that they lack normal behavior will help in developing management strategies based on individual behavioral profiles and personalities to meet their social needs. This landmark study also adds extremely valuable empirical support for arguing against people having privately-owned chimpanzees and other animals where they cannot possibly get the social experiences, care, and humane treatment to which they are entitled and so clearly and dearly need. Of course, people who have rescued dogs, cats, horses, and other animals who have had less than an optimal upbringing know that it takes a lot of hard work and often incredible patience to bring these unsocialized individuals "back to normal" or close to it. I hope this study receives a lot of attention from people working on a wide range of animals who are reared in captivity. We owe it to each and every individual to do the very best we can so that they can live the best lives possible in our care.